The Apache Mini ATV offers true off road capability at an unbeatable price. When plowing through mud, dirt and rocks, an ATV needs torque... lots of torque! The Honda®-Based 4-Stroke Engine in the Apache was designed and tuned to deliver gobs of power so that you can tackle inclines, obstacles and anything else in your way. The fully automatic centrifugal transmission and low gearing mates perfectly with the Apache ATV's H-Frame and long-travel suspension system. Industrial ruggedness comes from this off-roader's alloy steel twin-guard bumper, undercarriage skid plates, flexible ABS body panels and mud guards. The double A-Arm front suspension and rear trailing arm setup ensures that this ATV's 14½" Mudslinger Knobby Tires will be clawing for every inch of traction in the wilderness. And if you are planning to go even deeper into your adventure, the Dual-Stage headlights and tail lights, extra capacity fuel tank, oversized storage rack and leatherette deep cushioned seat will make sure you get there safely and comfortably, with everything you need. Stopping power comes from dual front brakes and a hydraulic rear disc brake, along with an emergency foot brake, unique to our line of Mini ATVs. A keyed ignition system, push-button electric start, waterproof battery and ZR-X Alternator will keep your All Terrain Vehicle ready to go at anytime. Other safety features include a handlebar mounted kill switch along with a Remote Controlled Auto Shut-Off that can cut power to the Apache from over 30 feet away! And the adjustable Speed Restrictor (governor) can be dialed from top speed, trail blazing action all the way down to 5 mph. 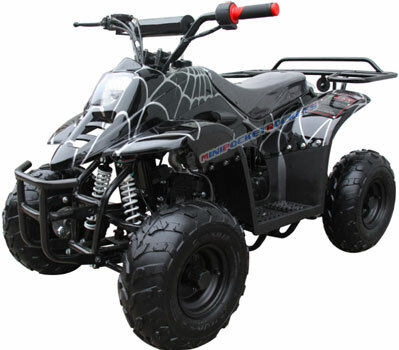 This not only gives the beginning rider a safety net to get used to riding this ATV, but it is also great for limiting power output in situations that call for strategic off-road maneuvers. Just attach the wheels, connect the battery, add gas, and you are ready to tear up the path. The Apache Mini ATV packs high-end features in a smaller, lightweight vehicle that is great for adults and kids alike! Included Free with Apache Mini ATV: Tools, Ignition Keys (2), Charger, Remote Control, Registration Papers / Title of Ownership, Owner's Manual, Informational DVD and our free extended warranty.